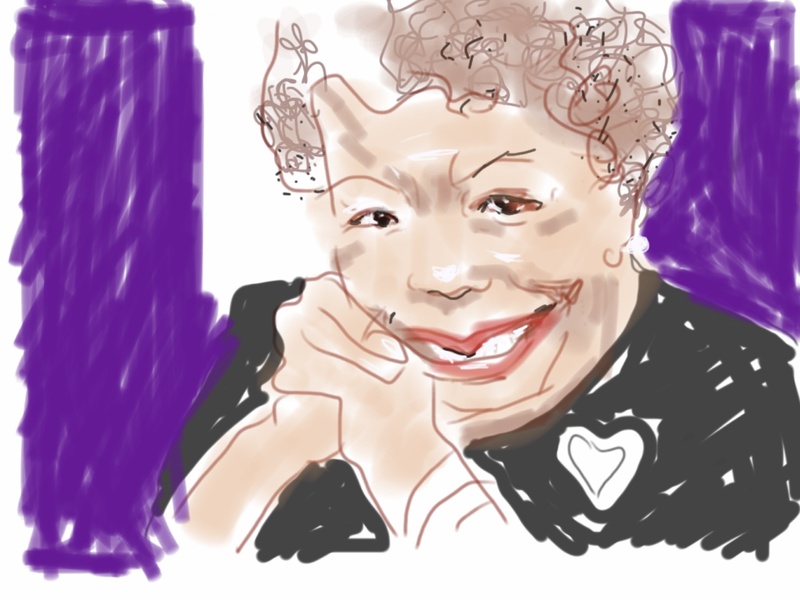 I just wanted to look at Dr. Maya Angelou’s face awhile, so I drew her. Those shining eyes. That impish mouth. That joy. Glance at the breadth and depth of her creative explorations and you know she was woman after my own heart–memoirist, actress, singer, dancer, essayist, activist, producer, professor, poet. 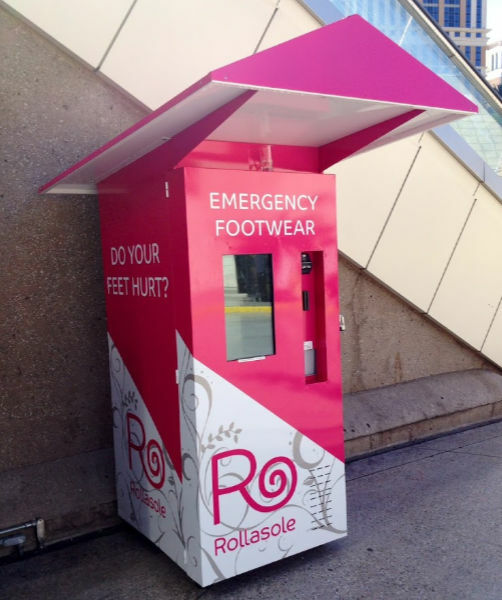 And though she bore a lifetime of scars, she was Dignity personified–a walking reminder to continually pull yourself up by your own bare feet even if you have no bootstraps. Some years ago, I was privileged to hear her speak. The sound of her voice was like caramel, if it, like chocolate, came in bittersweet: a rich pour that seemed to flow from a vast ancient amphora of ancestral wisdom, prompting love, tolerance, forgiveness. And I acutely appreciate her reflections on aging. I’ll direct you to the first twenty seconds of the Master Class she did for Oprah, though of course the entire event is well worth watching. It’s hard to believe this mighty presence no longer dwells among us. But her spirit will continue to do so. It was uncaged decades ago. A bit of news: I have mentioned here how pleased I am to have a poem in A Slant of Light: Contemporary Women Writers of the Hudson Valley. I was just notified that the book has now received five prizes–get a first edition while you can! Oh, the fuzzy muzzy muddle-headed mediation of a cold! Right in the middle of this scurrying season, the flow of life congeals, senses blanketed in thick subterranean retreat, jello in the veins and brain. Though people come and go throughout your day, forget your appearance–nothing makes your puffy self attractive. Red rims every feature of your face, your cracking voice seems to be emerging from an antique bathosphere, and the few movements you care to make are like a stop motion animation with the motion mostly stopped. But there is comfort in withdrawal after a week of intense effort. And perhaps at day’s end, you can, in your pajamas, gather sorrel from the garden, roast garlic and shallots, chop the last potato, sip that savory soup, mix a toddy of brandy-addled ginger tea, climb into bed with an old-fashioned whodunnit, blessed by the faint but detectable scent of a nosegay of muguets you plucked. And that’s nothing to sneeze at. 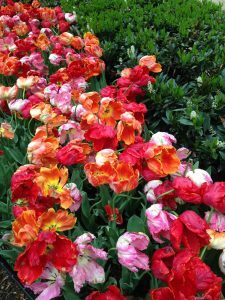 As the old song goes, while strolling through the park one day, in the merry, merry month of May, I was taken by surprise… by the colossal size and the glory of the tulips on the way. 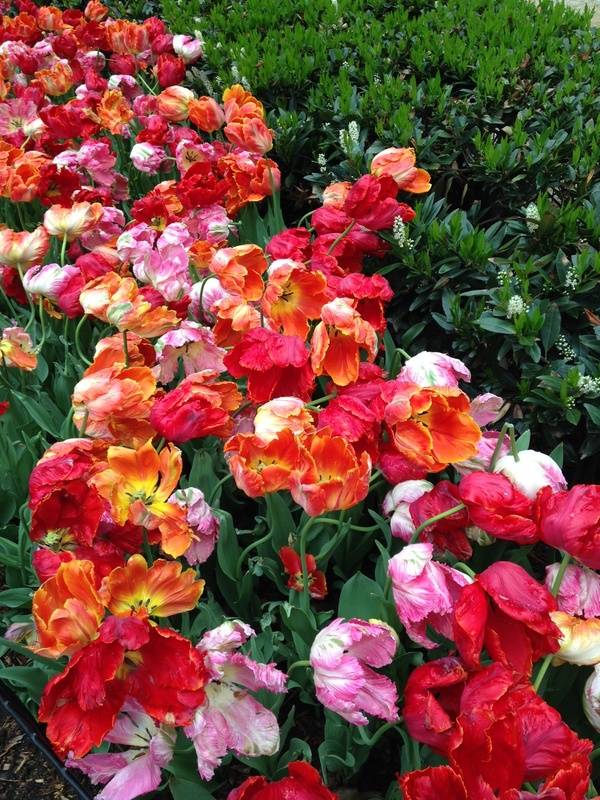 These opulent beauties are gracing Madison Square Park for a few more days. But I cannot linger to describe or draw conclusions from them (not that they need it) for I teach a dozen poetry classes this week to help our local schoolchildren cherish the natural world. (Thanks to the Hudson Highlands Land Trust’s River of Words program.) So it’s a short post today. Monday was School Forest Day here in Garrison, and I was asked to conduct a few sensory awareness exercises with first-graders. We watched leaves dance, listened to myriad sounds, learned to know a personal rock by touch alone. Here are the blooms I’m cultivating in our country woods–with any luck, they’ll keep blossoming for years and years. At dinner the other night, John and I were served a delicious dish of sautéed fiddlehead ferns. I always feel a bit guilty eating them, since they burst so with promise, as did this one outside my cabin door last Friday. As we munched, I was reminded of my slenderest little volume, eight pages long. 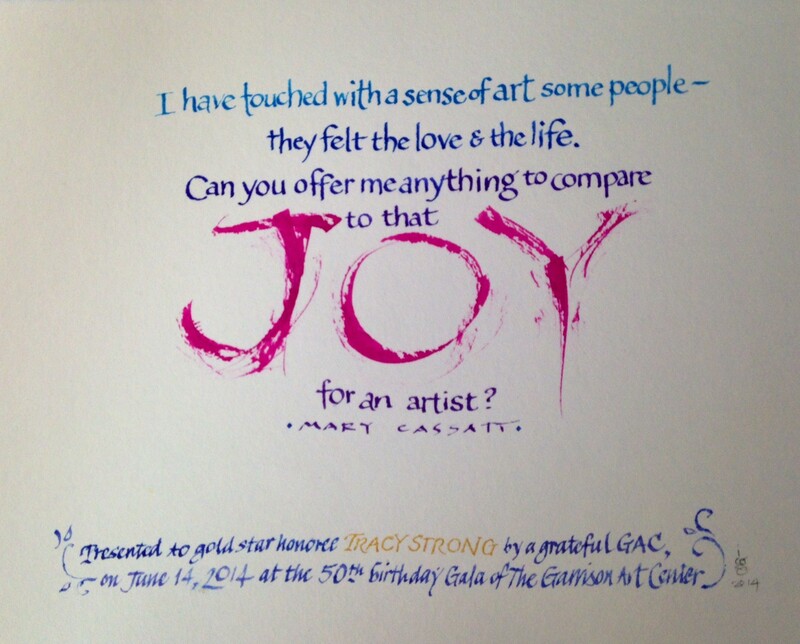 Tracy Strong and I conceived, designed and printed it spontaneously in a single day in 1995 to accompany my show Stand-Up Dreams. Such thoughts have a different quality from either dream or waking reality, and while I don’t always know what they mean, I enjoy attending to them. It made me laugh when I wrote down, but I didn’t fully get its meaning until I took this photograph a few moments ago. That’s the very same fern in the top photo, but how the days have changed her. Her head is nearly all unrolled–though, for the moment, her leaflets are fiddling still. This fleet season, these few days when opening leaves are V’s on the trees, is like that ephemeral state between sleeping and waking–a sweet surprising passing gossamer of consciousness. Reminding us that life, at any stage, still bursts with promise. What are you fiddling with these days? But shock occasions reflection and reflection, gratitude. Words on a page. Important, like boxcars, for what they convey. Which is us. Reading, we ride with the engineer. Worlds of our joint creation spring up around the locomotive. Non-fiction writers can take us anywhere —this author explored the Arctic, for example, so I can share somewhat in that experience. What expert scouts good writers are! Fiction writers take us inside of each other, inside of ourselves. 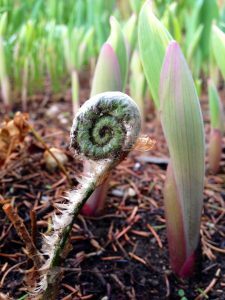 They train our inner ear to our inner life—that slippery ongoing stream of psychological states which filter, flow and congeal into physical experience. And poets? Well, they don’t use tracks at all. They just beam us from place to place. Isn’t it wonderful, this magical travel through each other’s minds and experiences? Even if sometimes the page is glowing glass, not paper. 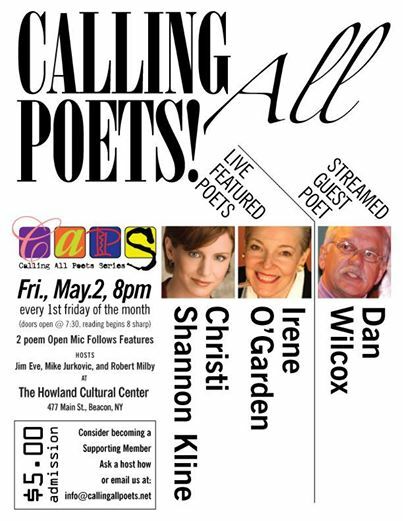 Looking forward to seeing wonderful folk this Friday night at my reading in Beacon at The Howland Cultural Center! 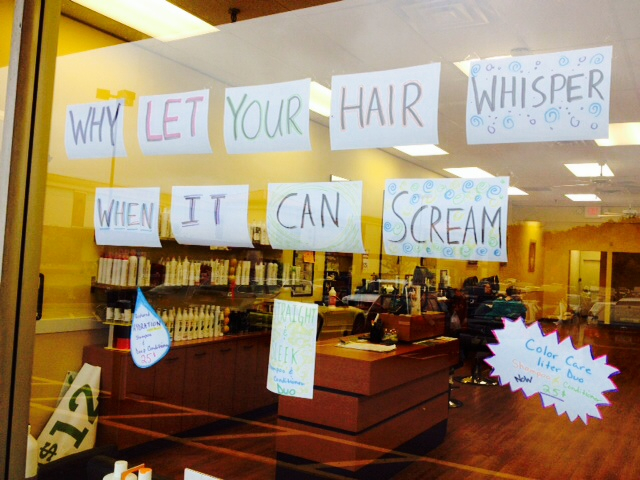 To listen to this post, please click here:Why Let Your Hair Whisper? Don’t you get a kick out of life? You just never know what you’re going to see when you pop into a shopping plaza. Before I offer my answer to this interrobang-less question, however, I do want to note with warmth and affection that this vigorous and colorful bit of marketry was done entirely by hand—an increasing rarity in signage these days. Nor does it feel like a corporate suggestion, or something someone would pick up on a salon-tips website, also an increasing rarity. “Why let your hair whisper when it can scream?” has the cachet of an original notion. Was it the boss’ vision, or an enterprising employee’s? Perhaps they are one and the same person. Either way, you can picture the grinning artist with her stack of big printer paper and her markers, twirling away, bringing in business. For if I wanted my hair to scream, I’d want a salon where people clearly have fun with line and color and, in evidence on the smaller signs, scissors! Because though my hair’s short, it’s still close to my ears. Have you an answer you don’t need to google? Thanks to the lovely Liz Gilbert for yesterday’s Facebook Fan Page post featuring my work! And a reminder that I’ll be a featured poet on May 2–please come hear the new work! Though momentarily concealed, the sun was out long enough this week to bless the dining-room bouquet, soften the earth in the garden and distribute a general feeling of relief here in the Hudson Valley. Help arrived yesterday and busted up the last crusty, recalcitrant, gravel-studded humps of snow; scraped away the tattered mats of autumn leaves, and leveled all the yellow silhouettes of “winter interest”—those grasses, rosehips, dessicated flowerheads we leave in the bleakened landscape to lift our hearts. Snowdrops, crocuses, green poking spears –all the lovely little Spring clichés bring comfort, for I’m wrestling with the angel of an old writing project. Caught myself thinking that finishing it will be quite an accomplishment. Those poking crocuses remind us creative projects are not sets of tasks, either, but living things, with their own seasons, growing out of ourselves into themselves and at last, springing free of us. What’s springing up in you these days? One Poem a Day Won’t Kill You” celebrates April as National Poetry Month by inviting community members to read a favorite poem, original or borrowed. The project drew such an enthusiastic response that April may be a bit longer than usual this year. Tune in each day for a new addition to a delightfully inspiring anthology of poems and voices. Captured this image last week in Las Vegas, where family members gathered to surprise my younger brother Jim on his 60th birthday. The trip was healing–a wonderful chance for us all to laugh and connect for happy reasons. Nephew Mike and his delightfully droll wife Jolyne brought along our newest family member, Creighton, soon to turn one, and a joyful presence he is. And, in the beautiful rolling wheel of our lives, so recently touched by death, came news of their second baby, due in October. Praise life. Happened to notice that today marks my one-hundredth post. Know that your eyes and ears continue to inspire me. Thank you.